My husband Ron and I have been trying desperately to have a baby since we were married in October 2004. In April of 2008 we became pregnant and were ecstatic; sadly, I miscarried nine weeks later. Approximately two months later we were excited to discover that I was pregnant again, only to have our hopes dashed when I miscarried at 9 weeks. Two pregnancies and two miscarriages later I became more than a little depressed. 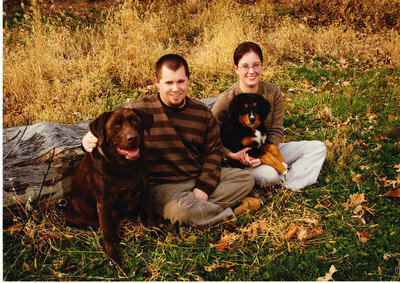 Our current family included two cats and a chocolate labrador retriever Riley; however, Riley had always been more of my husband’s dog than mine. We decided that this was a perfect time for me to have a puppy of my own and the breed that I was set on was a Bernese Mountain Dog. I quickly began looking for the perfect puppy that was the right price and in the right location since we would be driving to pick him/her up. My search did not last long! I found a female puppy in Millersburg, Ohio which was about three and a half hours from home in Pittsburgh! I made the phone call to the breeder and arrangements were made for us to meet this beautiful girl! Ron, Riley and I set out to see this potential new addition; we told ourselves that we were not set on this puppy and we needed to make sure she was a “good fit” for our family. That three and a half hour drive seemed like an eternity! We finally found the road to the breeder’s house, but as we drove down the road the house numbers were going in the wrong direction from the address we had listed! Had we made a wrong turn? Copied down the wrong address? We had not seen any houses the other way; nonetheless, we turned around and went back in the direction from which we came. There it was…the house we were looking for…with a small pen set up in the front yard…and one little black, brown and white ball of fur waiting for us! I looked at her and she looked at me…then she “commando crawled” right to me…that was it…sign over the check…it was love at first sight…and still is, each and every day that I look into those beautiful brown soulful eyes! We are not yet parents to the baby for which we long, but Molly (and all of our other furry children) are the recipients of that endless love instead! Not only do they GET that love but they GIVE it back a hundred-fold!